and may take a while to load depending on your connection. 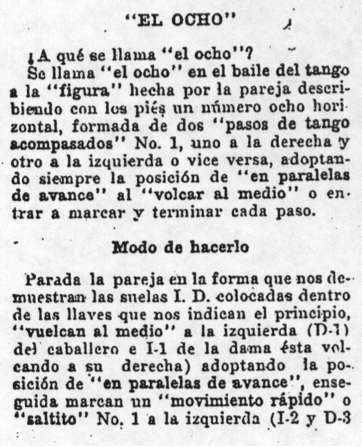 El Tango Argentino de Salon: Método de Baile Teórico y Práctico (undated, c. 1916) by Nicanor M. Lima is the earliest known Tango dance manual written by an Argentine, describing how Tango was danced in Buenos Aires in the early 20th century. Following the Tangomania of 1912-1914, in which Tango became the newest dance craze in Paris, and subsequently, around the world, many Tango descriptions were published in Europe and the United States. But questions have remained as to how "authentic" these descriptions of Tango were. Many dancers of Argentine Tango today believe that European and American dancers changed the character of the dance, and that the original Tango more closely resembled the Argentine Tango style of today. 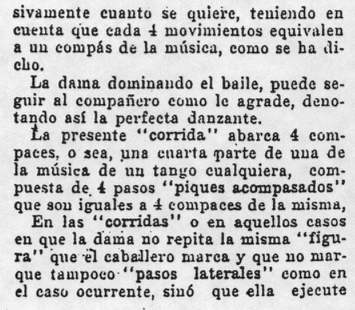 In an effort to answer this question, Stanford dance historian Richard Powers recently made available a digital copy of this important Argentine dance manual, along with an in-progress English translation, and a glossary of many of its figures. 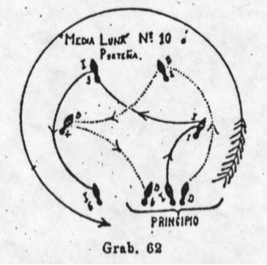 This webpage is a continuation of this ongoing effort, presenting a near-complete reconstruction of these early Tango steps by Richard's long-time collaborators at Stanford, Nick and Melissa Enge. 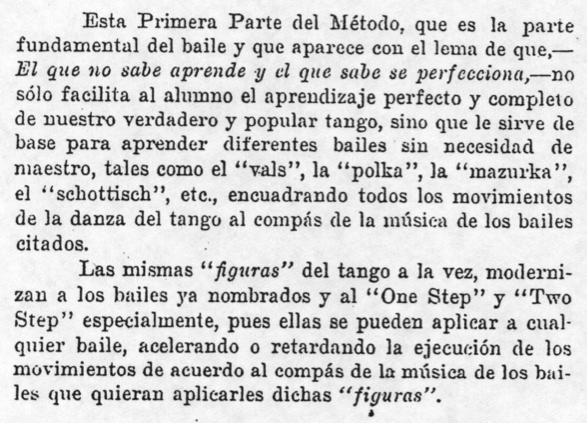 The steps are clearly described in English, accompanied by Lima's original illustrations (and his descriptions in Spanish). In addition, they are illustrated by videos of Nick and Melissa dancing them to a period song in period attire in a period ballroom. Before we describe the individual steps, here's a video that illustrates the basic character of the dance. 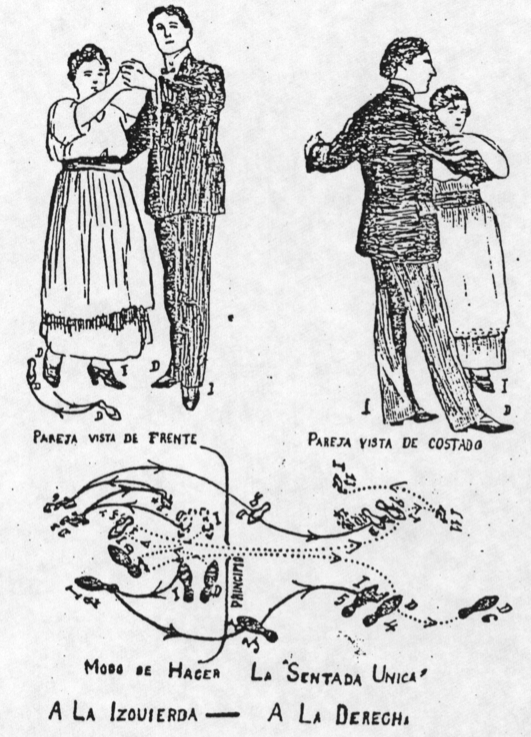 While 21st century Argentine Tango is often danced in close embrace, the 1916 Argentine Tango described by Lima is danced in a position similar to the 19th century Waltz position. 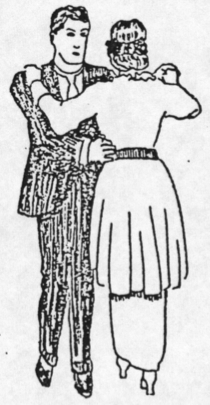 Lima writes that the Lead places his right hand on the Follow's waist, higher than the hip, while the Follow places her left hand on his right shoulder, without resting her elbow on his arm. 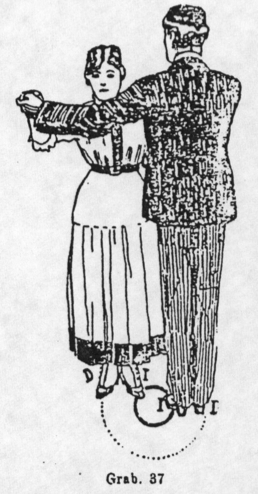 The Lead holds the Follow's right hand in his left, his palm over her fingers, both hands facing down, at the level of his shoulder, with both arms almost fully extended. En Línea (In Line): Facing partner squarely (i.e., Closed Position). 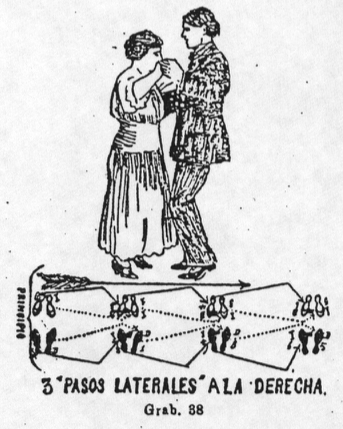 En Paralelas (In Parallel): Facing partner, but at each other's sides, hip to hip (i.e., Yale Position). There are two versions of this position: right hip to right hip, and left hip to left hip. 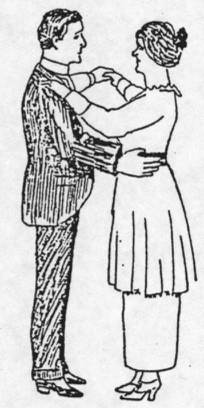 En Paralelas de Avance (In Parallel Forward): Both facing the held hands (i.e., Promenade Position). You can also dance over the elbows in this position, in which case it's called En Paralelas de Retroceso (In Parallel Backward). Este punto es de mucha importancia en el baile, por consiguiente no conviene olvidarlo. This point is very important to the dance, so you shouldn't forget it. La dificultad del tango, que lo ha proclamado la danza más elegante y hermosa del mundo, consiste en que, de las diversas combinaciones que se pueden hacer el mismo, en ningún caso la pareja podrá separarse o soltarse, bailando solos o aislados, al combinar o hacer una "figura" cualquiera, podrá sí cambiar de una "posición de los cuerpos" a otra, pero siempre conservando la postura del baile. The difficulty of the Tango, which has been proclaimed as the most elegant and beautiful dance of the world, consists in that, of the diverse combinations that can be done, there is never a case in which the couple can separate or release each other, dancing alone or solo. 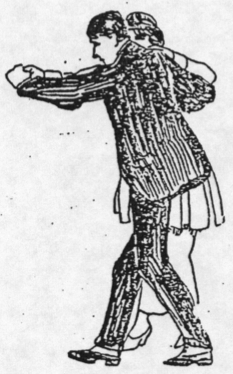 In combining or going through whichever step, they can change from one body position to another, but always conserving the posture of the dance. 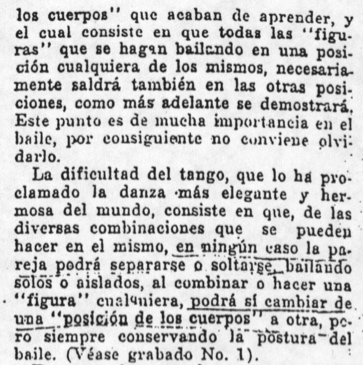 In Modern Dancing (1914), Vernon and Irene Castle write that the Tango "is not only a dance, it is a style; to master the Tango one must first master its style, absorb its atmosphere." The style of walking is natural and elegant, leading with the ball of the foot (rather than the heel), knees slightly flexed. 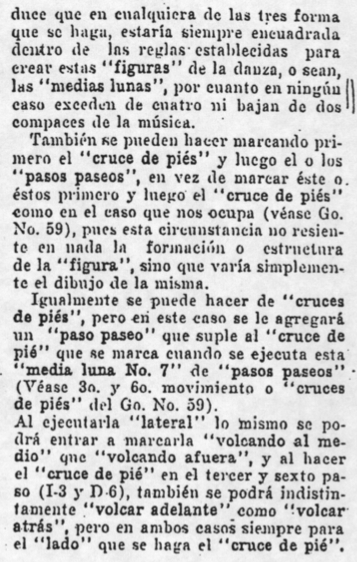 Lima writes that steps can be executed "sobre la punta de los piés sin tocar el taco en el suelo, con las empeines ligeramente flexionados al dar cada peso, ó asentado igualmente algo fuerte toda la panta de los piés, en el último caso flexionando poca cosa las piernas solamente (over the toe of the foot without touching the heel on the floor, with the insteps lightly flexed on taking each step, or placing equal weight throughout the soles of the feet, in this case flexing only the legs). 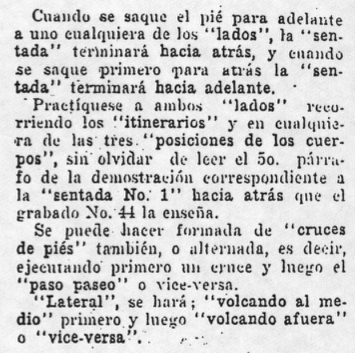 Generally speaking, steps should be of equal length, and executed with "soltura, con mucha gracia, naturalidad, y elegancia, bien acompasado, . 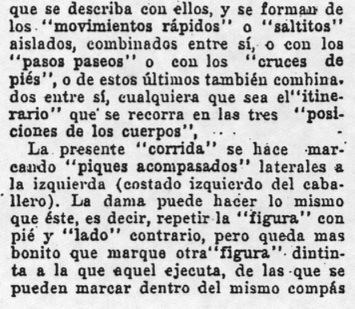 . . y describiendo semicírculos o líneas curvas con los piés al caminar" (ease, grace, naturalness, and elegance, in time with the music, describing semi-circles or curved lines with the feet while walking)." 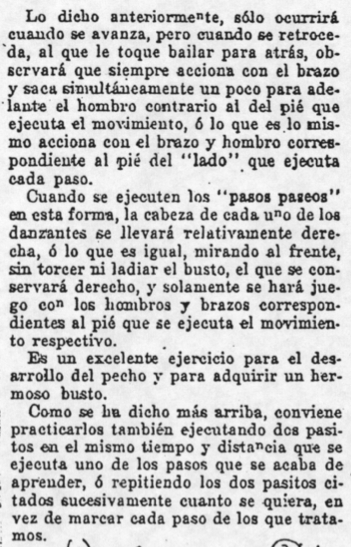 While the shoulders are free to move in order to facilitate leading and following (as in the case of a Grapevine), the head and torso should be carried "más sereno y derecho" (most serene and straight). 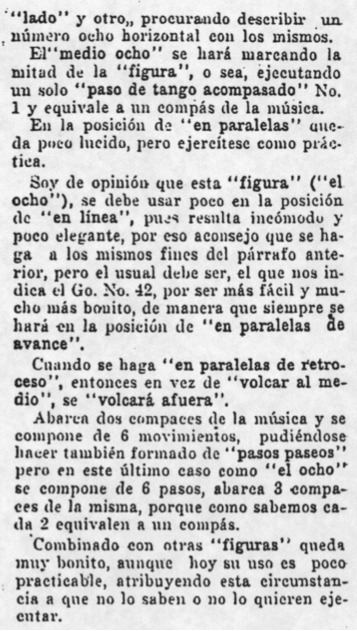 As a result, Lima writes that Tango is "un excelente ejercicio para el desarrollo del pecho y para adquirir un hermoso busto" (an excellent exercise for the development of the chest, and for acquiring a beautiful bust). Style pointers specific to particular steps can be found in the corresponding sections of this webpage. 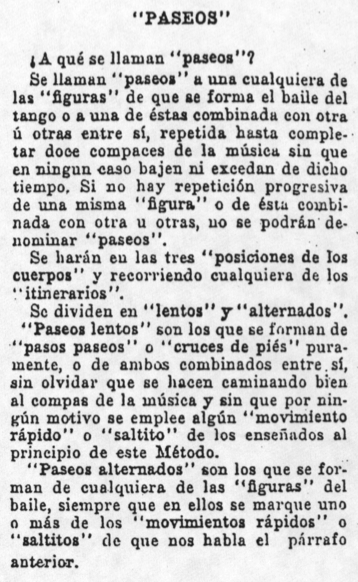 Lima writes that Tango music is written in slow 2/4 time, composed of phrases of 8, 16, or 32 bars (16, 32, or 64 slow counts), most commonly 16 bars (32 slow counts). To fit the music, Lima's figures are composed of 1, 2, 3, 4, 8, or 16 bars of music. 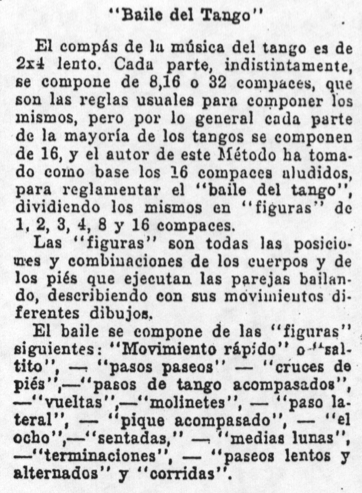 These figures include: Movimientos Rápidos, o Saltitos (Quick Steps), Pasos Paseos (Slow Steps), Cruces de Piés (Cross-Steps), Pasos de Tango Acompasados (Rhythmic Tango Steps), Vueltas de Tango (Traveling Turns), Molinetes (Turns in Place), Paso Lateral (Side Steps), Paso Pique Acompasado (Rhythmic Rivalry Step), El Ocho (Figure Eight), Sentadas (Sitting Steps), Media Lunas (Puzzle Steps), Paseos (Sequences), Terminaciones (Endings), and Corridas (Runs). In 21st century Argentine Tango, dancers often dance off the music, "dancing to the soul of the music" instead of the beat. 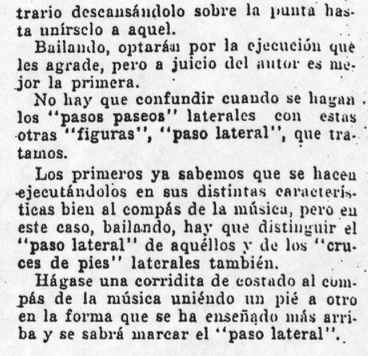 In 1916, however, Lima is quite clear that dancers are expected to stay exactly on the beat the whole time. 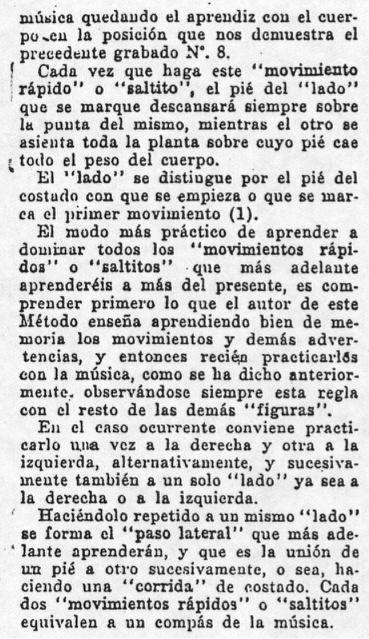 The steps should always begin at the beginning of a musical phrase, Lima writes, and if the 31st and 32nd slow steps do not coincide with the 16th bar of music, "estarán mal ejecutados, significando que se han apresurado o demorado a marcarlos bien iniciándose mal con la música o perdiendo el paso o el compás de la misma (they will be poorly executed, meaning that they were hurried or delayed, or that they were not started in time with the music, or the step or beat of the music was lost)." 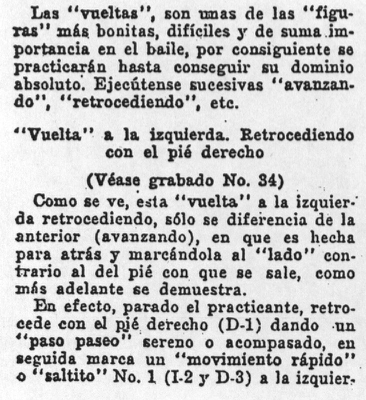 Esta Primera Parte del Método, que es la parte fundamental del baile y que aparece con el lema de que,—El que no sabe aprende y el que sabe se perfecciona,—no sólo facilita al alumno el aprendiazaje perfecto y completo de nuestro verdadero y popular tango, sino que le sirve de base para aprender diferentes bailes sin necesidad de maestro, tales como el "vals", la "polka", la "mazurka", el "schottisch", etc., encaudrando todos los movimientos de la danza del tango al compás de la música de los bailes citados. 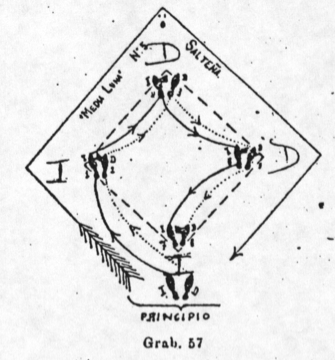 This first part of the Method, which is the fundamental part of the dance and which appears with the motto that "He who does not know, learns, and he who knows, perfects," not only facilitates the student in the perfect and complete learning of our true and popular Tango, but it also serves as the base for learning different dances without needing a teacher, such as the Waltz, Polka, Mazurka, Schottische, etc., incorporating all the movements of the Tango to the time of the music of the aforementioned dances. 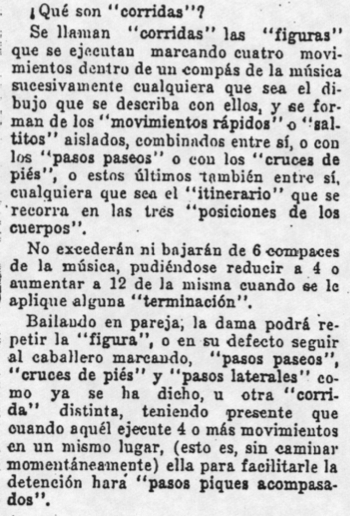 Las mismas "figuras" del tango a la vez, modernizan a los bailes ya nombrados y al "One Step" y "Two Step" especialmente, pues ellas se pueden aplicar a cualquier baile, acelerando o retardando la ejecucíon de los movimientos de acuerdo al compás de la música de los bailes que quieran aplicarles dichas "figuras". 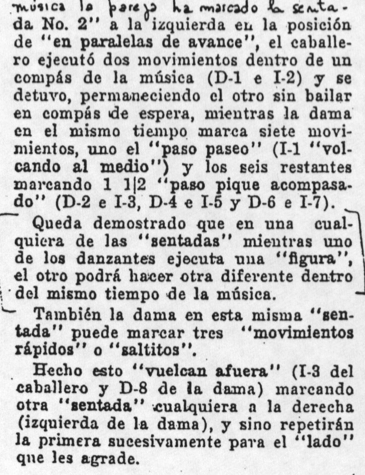 At the same time, the figures of Tango modernize the aforementioned dances, and the One Step and Two Step especially; therefore, these steps can be applied to whatever dance, speeding up or slowing down the execution of the movements in accordance with the timing of the music of the dances. This concept of adapting Tango figures and styling to different kinds of music can still be seen today in the form of Milonga and Vals. 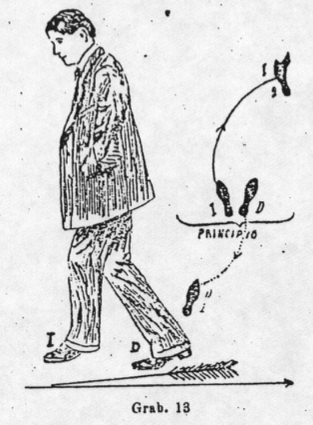 To begin a figure, the Lead advances with his left foot, or retreats with his right foot. 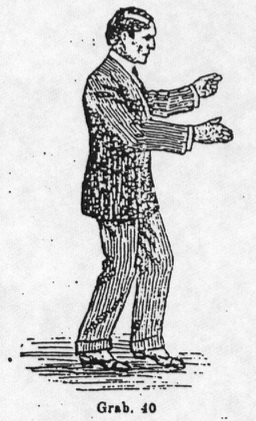 If he intends to dance a figure to his right, he starts with his left foot, and vice versa. 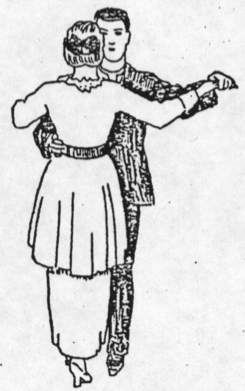 The Follow dances opposite the Lead: she retreats when he advances, and vice versa, on the opposite foot, and when he steps to his left, she steps to her right. 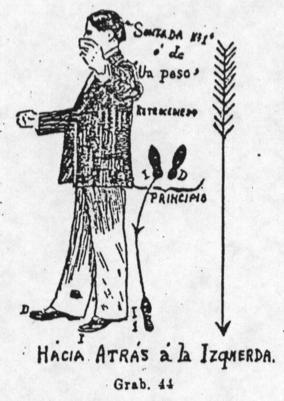 (Promenade Position bends this rule, as she dances in the same direction as the Lead, but even then, she will still be on the opposite foot.) With regard to cross-steps, sometimes they are mirrored (both cross in front, or behind), and sometimes they are parallel (he crosses in front as she crosses behind, or vice versa)—it depends on the figure. When turning, both partners rotate the same direction, always facing each other. As noted above, the partners must always remain in each other's arms, never separating from each other. Any step danced in one dance position can also be danced in any other position. Any step danced in one direction can also be danced in any other direction (as illustrated below). Saltitos (little skips), or Movimientos Rápidos (rapid movements) are quick steps, two per count. Da un paso corto al costado con el pié derecho asentado la punta del mismo con la pierna flexionada . . . en esta posición le une enseguida el izquierdo, descansando el cuerpo sobre la planta del mismo al unírselo aquél, también con la pierna ligeramente flexionada y cediendo levemente el cuerpo hácia abajo al hacer éstos dos movimientos casi simultáneos. Take a short step to the side with the right foot, setting down the toe of that foot with the leg flexed . . . In this position, you quickly bring the left together with the right, resting the body over the sole of that foot when it comes together with the first, with the leg slightly flexed, lightly transferring the body downwards during these two almost simultaneous movements. There are four different kinds of Saltitos, described below. Saltito No. 1 is a side-close to either side in quick-quick timing. This can be repeated, creating a quick run to the side. 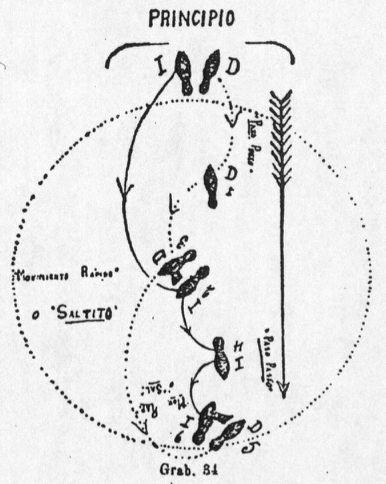 Our videos of the four Saltitos illustrate them as they would actually be danced—inserted into a longer sequence of walking. 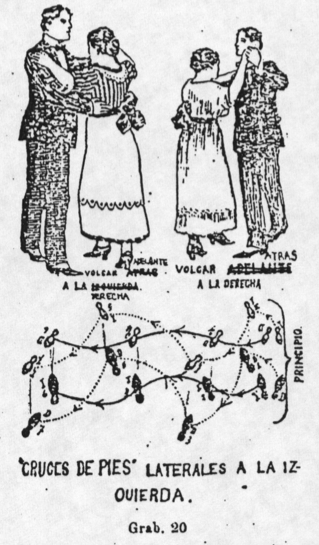 Here, you'll see three Pasos Paseos (explained below) on the Lead's left, and a Saltito No. 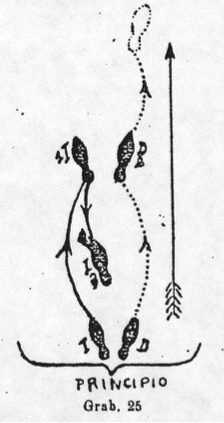 1 on the Lead's right, followed by the same sequence danced on the other foot. As you'll see in the video, this Saltito is useful for shifting to the side, and/or getting you on the other foot. Saltito No. 2 is essentially a half break-step, useful for changing directions. Before walking forward, the Lead quickly rocks back and forward in the space of one count. 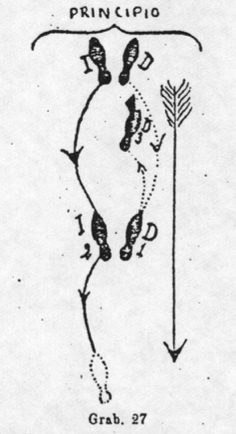 Before a step forward with the left foot, the Lead first rocks back on the right (1), then rocks forward again (and). 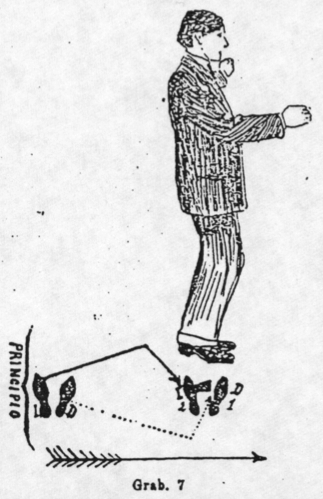 On count "and," he does not take weight, but holds the left foot slightly (5 cm) above the floor, in preparation to step forward on it on count 2. This can also be done before a step forward with the right foot, or before a step back with the right or left, for a total of four variations. 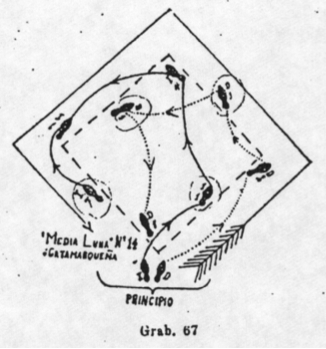 As noted above, this Saltito is useful for changing directions. Saltito No. 3 is a quick locking step that crosses behind an advancing step, or in front of a retreating step. For example, if the Lead advances with the left foot, he might quickly lock his right foot behind his left. If the Lead retreats with his right foot, he might quickly lock his left foot in front of his right. Similar to Saltito No. 2, there are four possible variations of this step. This Saltito is a great way to ornament your steps. Saltito No. 4 is a quick turning and crossing variation. Step forward with the left, turning to the left, and cross the right behind the left. Or step forward with the right, turning to the right, and cross the left behind the right. Or step backward with the left, turning to the right, and cross the right over the left. Or step backward with the right, turning to the left, and cross the left over the right. The utility of this Saltito was unclear until we actually danced it in context, at which point we noticed that it elegantly turns you 90° as a couple. Pasos Paseos (walking steps) are slow steps, one per count. 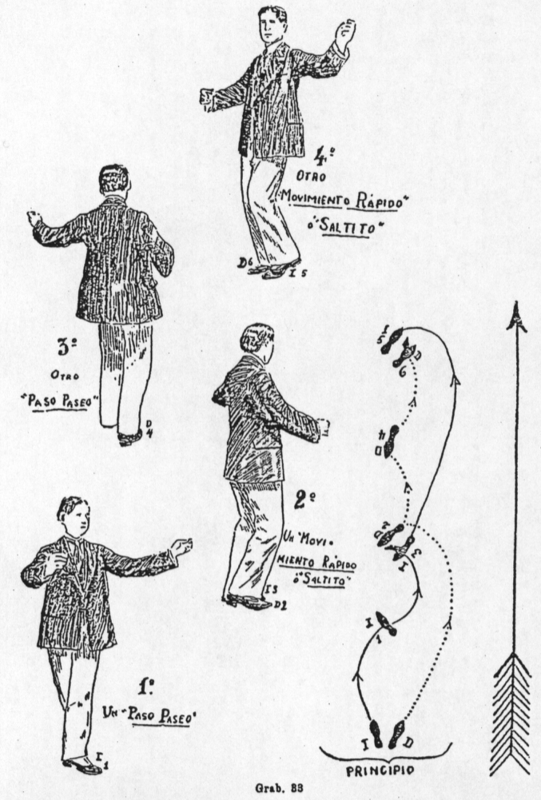 Lima notes that they can be danced in any position, and in any direction, and should be executed as naturally and elegantly as possible. He also notes that they can be executed while turning 1/4, 1/2, 3/4, or a full turn in either direction. 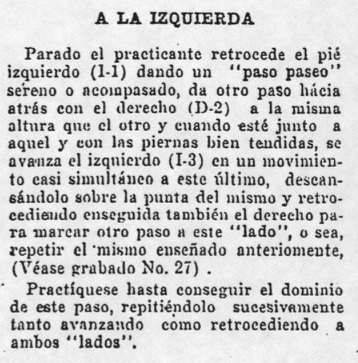 Later, Lima writes that any step that you do in Paseo timing can also be done in Saltito timing, taking half a count for each step (known as "Pasitos"). Led clearly, these can be inserted into an otherwise serene Paso Paseo to add variety. Pasos Paseos Serenos (calm walking steps), are calm, natural walking steps in time with the music. 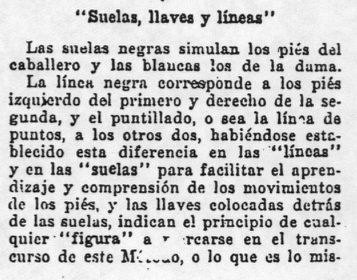 As noted in the Style section above, Lima writes that the steps should be of equal length, and executed with "soltura, con mucha gracia, naturalidad, y elegancia, bien acompasado, lo más sereno y derecho el cuerpo y describiendo semicírculos o líneas curvas con los piés al caminar" (ease, grace, naturalness, and elegance, in time with the music, with the body serene and straight, describing semi-circles or curved lines with the feet while walking). Pasos Paseos Acompasados (rhythmic walking steps) are walking steps with a rhythmic downward undulation. The only difference between Pasos Paseos Acompasados and Pasos Paseos Serenos is that the the supporting knee is flexed (bent) as the traveling foot reaches forward or backward, giving these steps an undulating quality. While the legs undulate, the torso should remain erect and straight. Lima notes that some dancers sway the body to the opposite side of the flexing knee, but that this should not be exaggerated. 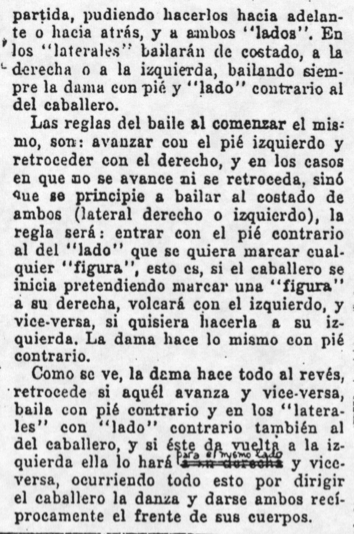 Lima writes that "estas indicaciones precedentes quedan a gusto de los danzantes, pues si quieren pueden hacerlas formadas de puro 'pasos paseos' serenos solamente" (these instructions are dependent on the enjoyment of the dancers, so if they want, they can also just do Paso Paseos Serenos instead). The purpose of Pasos Paseos Acompasados is simply to "adornarlas más, con mucha gracia, compás e imprimiénodles la mayor elegancia posible" (give the steps more flair, with as much grace, rhythm, and elegance as possible). Pasos Paseos Alternados (alternating walking steps) are are steps that alternate between one Paso Paseo Sereno and one Paso Paseo Acompasado, or vice versa. 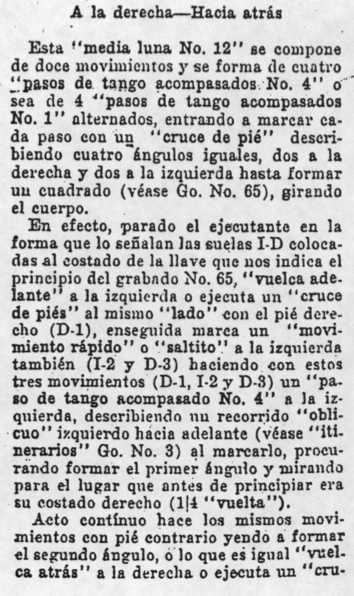 Lima writes that the characteristic of the step is that of "una persona que cojea" (a person that limps). 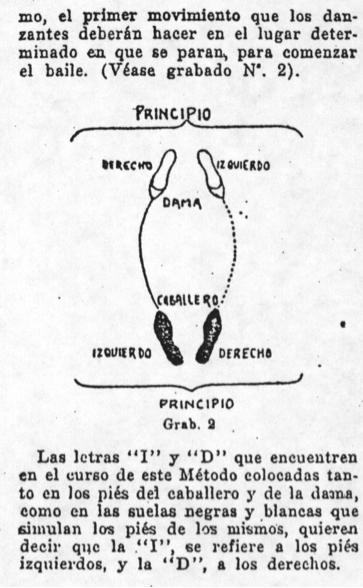 Lima write that Volcando El Medio (overturning the middle) and Volcando Afuera (overturning the outside) play an important role in Tango. They are mirrored cross-steps, in front or behind. Volcando El Medio: Both partners cross one foot in front of the other foot, crossing through the middle of the frame. This is especially important for transitioning from Closed Position (facing your partner) to Promenade Position (facing the same direction as your partner). 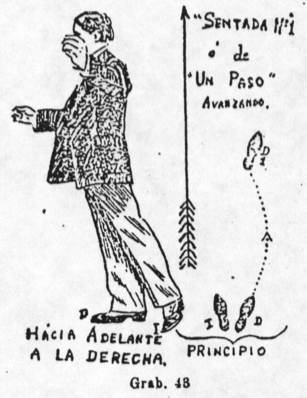 Volcando Afuera: Both partners cross one foot behind the other foot, crossing outside of the frame. 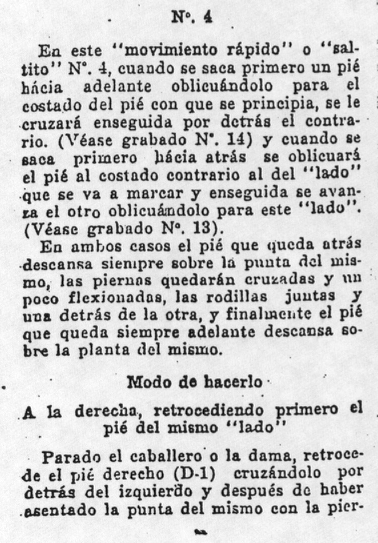 Volcando Sequence: As a further illustration of both kinds of Volcando, Lima provides an illustration of Volcando El Medio and Volcando Afuera in sequence, connected by a side step, forming a mirrored grapevine. The Lead crosses right over left, steps side left, then crosses right behind left. The Follow crosses left over right, steps side right, then crosses left behind right. Cruces de Piés (crosses of the feet) are crossing steps, danced either advancing and retreating, or laterally. They are danced in slow (Paseo) timing, one step per count, and can be done in any position and in any direction. Lima describes two basic kinds. The Lead crosses left over right, then right over left, repeated, advancing. 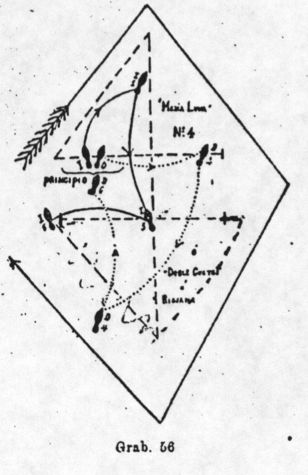 The Follow crosses right behind left, then left behind right, retreating. 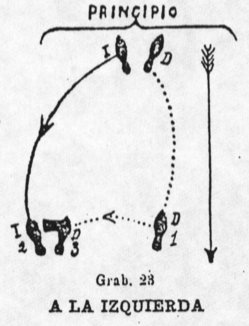 It can also be danced with the Lead retreating (crossing behind) and the Follow advancing (crossing in front). The Lead crosses right over left, steps side left, crosses right behind left, steps side left, as the Follow dances opposite. The Lead crosses right behind left, steps side left, crosses right over left, steps side left, as the Follow dances opposite. The Lead crosses left over right, steps side right, crosses left behind right, steps side right, as the Follow dances opposite. The Lead crosses left behind right, steps side right, crosses left over right, steps side right, as the Follow dances opposite. To change the direction of motion, you can follow a cross to one side with a cross to the other, i.e., Lead crosses right over left, then left over right. 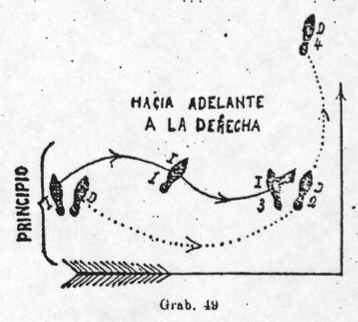 Lima notes that Cruces de Piés can also be done "también girando" (while spinning). Pasos de Tango Acompasado (rhythmic Tango steps) are combinations of one slow Paseo step with one quick-quick Saltito. 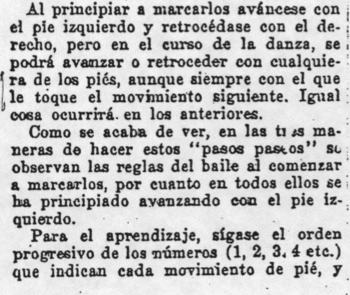 Lima notes that they can be danced in any position, and in any direction, and that each step can be repeated, first with one foot, and then with the other. This is a combination of one slow step forward or backward, followed by a quick-quick side-close (Saltito No. 1). As illustrated, the second foot arcs to place, rather than brushing by the first, as is the style in some other dances with a box step. This is a combination of one slow step forward or backward, followed by a quick-quick rocking hesitation (Saltito No. 2). 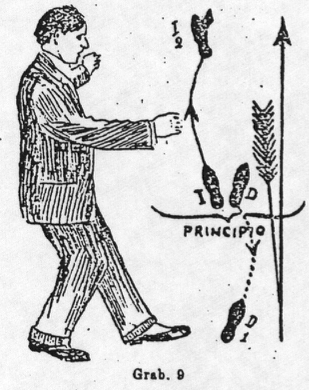 As illustrated, the second foot closes next to the first foot on count 2, and the first foot goes halfway back to home on "and." This leaves the second foot free to continue in the initial direction on count 3. 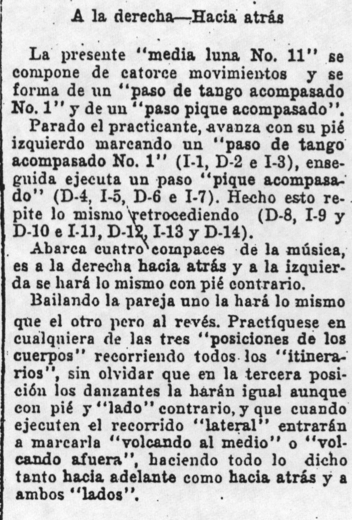 Interestingly, this description of Paso de Tango Acompasado No. 2 does not match the theoretical definition of a Paso Paseo plus Saltito No. 2. The video below illustrates the theoretical definition. 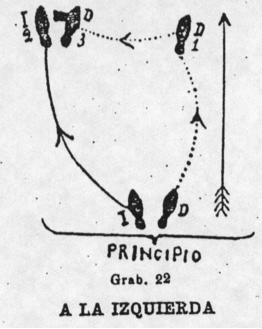 This is a combination of one slow step forward or backward, followed by a quick-quick locking step (Saltito No. 3). 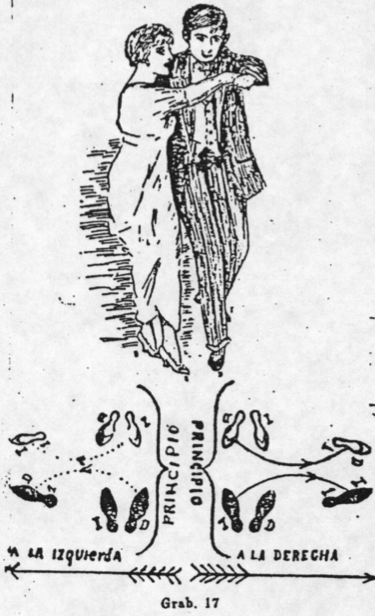 As illustrated, the second foot crosses over or behind the second foot, then the first foot locks behind it or in front of it, respectively. Lima doesn't describe this step in this chapter, but references it in the description of Media Luna No. 1. Based on the consistent construction of Pasos de Tango Acompasados No. 1, No. 2, and No. 3 (or at least No. 1 and No. 3), it seems likely that Paso de Tango Acompasado No. 4 is one Paso Paseo followed by Saltito No. 4. 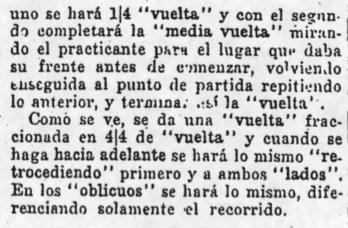 Vueltas (turns) are spinning, waltz-like turns in slow-quick-quick timing. 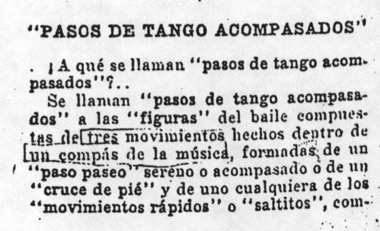 Lima notes that Vueltas are some of the most beautiful, difficult, and important figures in the Tango. 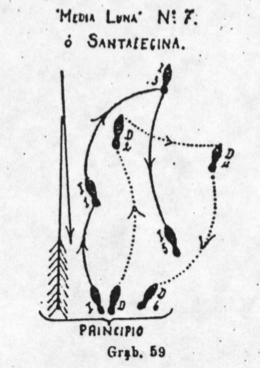 The step is simply a left-turning Waltz in slow-quick-quick timing, beginning with the Lead stepping forward with his left on count 1. It can also be started by stepping back on the Lead's right on count 1. 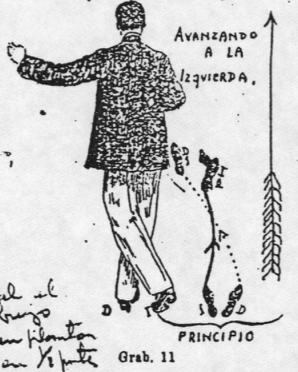 Although not explicitly described or illustrated, a right-turning Vuelta, starting with the right foot forward (or left foot back) is also mentioned. Molinetes (windmills) are turns in place, with one partner walking around the other, or both partners walking around each other. Lima describes several different versions. 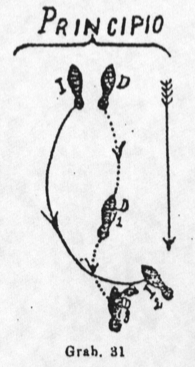 The Lead steps in place, leading the Follow to walk forward around him (clockwise when she's at his right side, counterclockwise when she's at his left side). Same as Version 1, but the Follow does a Grapevine around him. The Follow steps in place as the Lead walks forward around her. Both partners walk forward around each other at the same time. 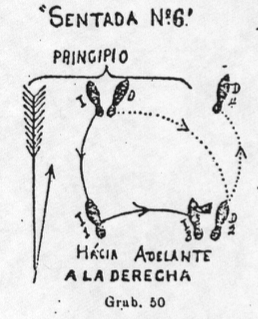 Lima notes that in any of the four Molinetes, the circling partner(s) can use any combination of slow and quick steps, as long as it adds up to eight counts of music, while the stationary partner steps slowly in place, one step per count. In addition, the direction of circling can be reversed at any time during the figure (shifting from one parallel position to the other), as long as you keep in time with the music. 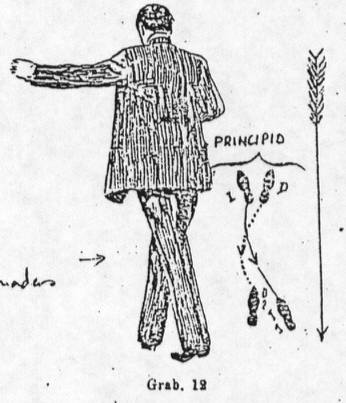 A Paso Lateral (side step), is a series of side-closes (i.e., a repeated Saltito No. 1). 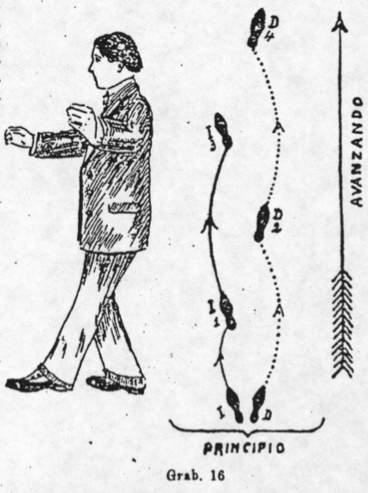 The direction of motion in a Paso Lateral can be changed in the middle by taking a long step to the side with the first foot, closing the second foot halfway to the first foot, then closing the first foot all the way to the second foot, as illustrated below. 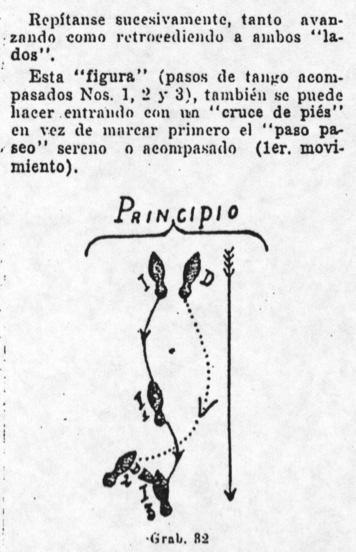 Lima also notes that a cross-step can be used to change the direction of motion, just as it was in the case of the lateral Cruces de Piés. 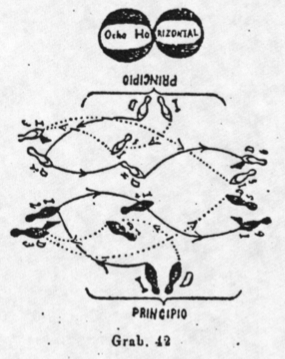 Paso Pique Acompasado (rhythmic rivalry step) is a figure in which the Lead and Follow's steps are in rivalry with each other. 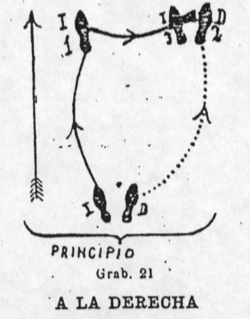 The Lead's basic footwork of the Paso Pique Acompasado is a double hesitation. The Lead rocks forward, back, forward, back, QQQQ. It can also be started on either foot, and can also be started by rocking back, for four possible variations. As in a Saltito, the forward and back rocking steps are only given half weight, with full weight coming down on the second foot, which stays in place. 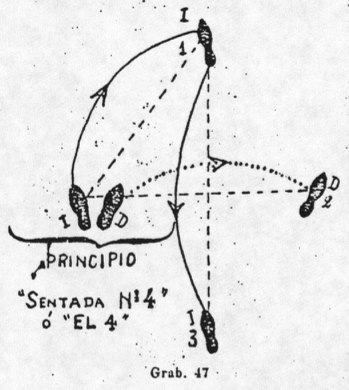 Traveling this step toward the side of the first foot, it becomes a Corrida (running step), which is the name for any combination of four quick steps in succession. 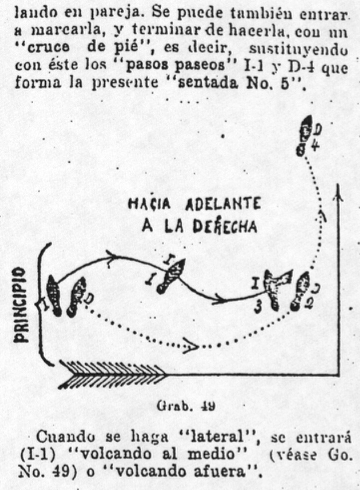 In the Paso Pique Acompasado Corrida, the Follow can dance opposite, but Lima advises against this. Instead, he says its better if the Follow dances her own choice of steps alongside the Lead, including promenading steps, cross steps, and side steps, in any combination. Her steps should be small and consistent, traveling exactly parallel to him, and she should continue to step right on the beat, QQQQ. 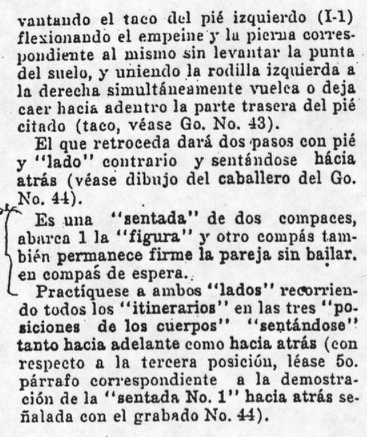 Lima notes that Corridas are the most difficult of all Tango steps, and if done correctly, this will say a lot about the dancer. 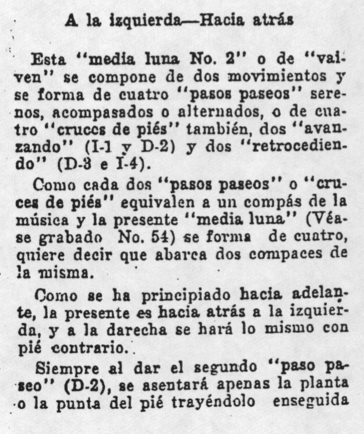 Lima also notes that half of a Paso Pique Acompasado can be combined with one or two Pasos Paseos. 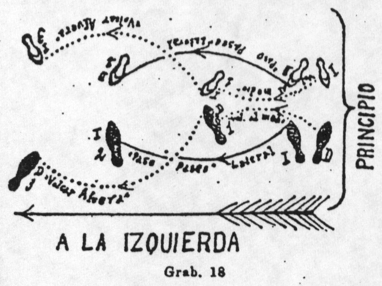 El Ocho (The Eight) is a figure in which the dancers feet trace a figure eight on the floor. It consists of two Pasos de Tango Acompasados No. 1, Volcando Al Medio on both Pasos Paseos. What this means in English is that the Lead crosses right over left (1) and does a quick side-close to the left (2-and) while turning in to face back the other way, as the Follow crosses left over right (1) and does a quick side-close to the right (2-and) while turning in to face back the other way. Repeat opposite, the Lead doing the Follow's footwork, and vice versa. 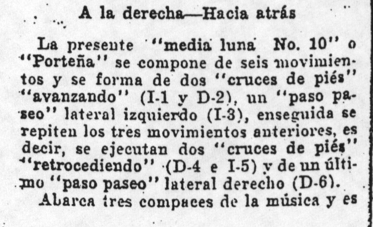 Lima also notes that El Ocho can be done En Línea (facing partner squarely the whole time) or En Paralelas (Lead crosses in front as Follow crosses behind, or vice versa), but sees little elegance in these options. 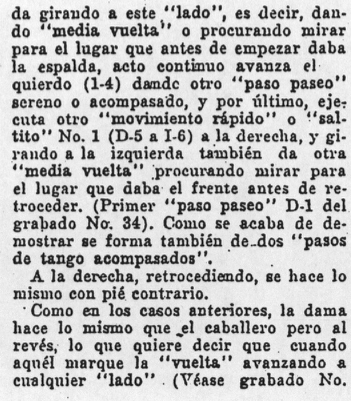 He also describes both partners crossing behind (Volcando Afuera), with no word on his opinion of this variation. 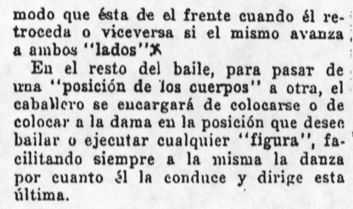 With regard to the opinion of dancers in 1916, Lima writes that El Ocho is a very beautiful figure, but that it is rarely used, either because the dancers don't know the figure, or they don't want to dance it. We, however, like it quite a lot, including the version danced En Paralelas. Other options include a Medio Ocho, half an ocho, and an Ocho in all slow timing (taking six counts). 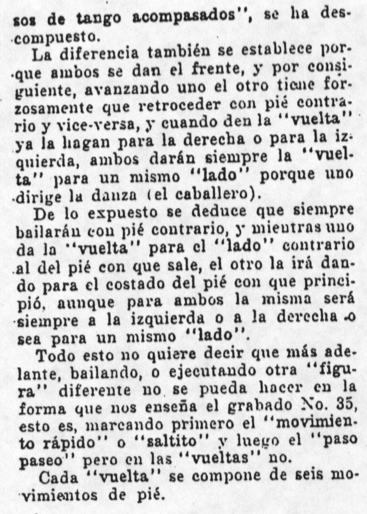 Though not listed as such by Lima, El Ocho also fits his definition of a Media Luna, being a step that is first danced on one foot, then repeated on the other. Sentadas (sitting steps) are variations that "sit" on the count, pausing for one (or two counts) before continuing. despues de dar el practicante el 'paso paseo,' . . . inclinará su cuerpo un poco hacia adelante, descansádolo sobre su pié del mismo 'lado' (derecho) mientras con el otro pié un poco hacia atrás y descansádolo igualmente sobre la punta del mismo, deja caer o vuelca la parte trasera del mismo (taco) hacia adentro o sea para el 'lado' derecho sin tocar el taco en el suelo uniendo simultáneamente la rodilla izquierda a la derecha y quedando la primera de estas un poco hacia atrás . . . Los danzantes procurarán imprimirles a estas 'sentadas' como a las que siguen la mayor elegancia, decencia, gracia y compás posible. Sentada No. 1 is a single slow step, followed by a pause of one count. For the styling during the pause, see "Sentada Styling" above. This can be done in any direction or dance position. Sentada No. 2 is two slow steps, followed by a pause of two counts. Sentada No. 3 is three slow steps, followed by a pause of one count. This can be done in any direction or dance position. 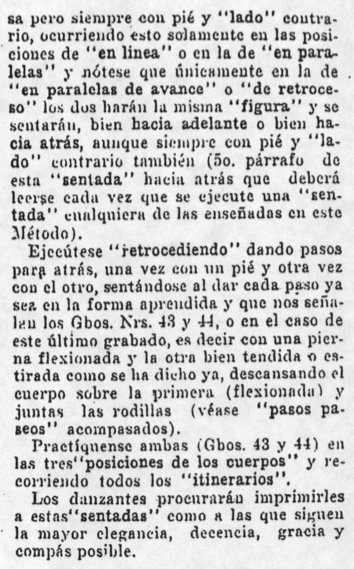 Lima also notes that you can "sit" on a cross step, or a promenading step (in this or any other Sentada). Sentada No. 4 is three slow steps in the shape of a 4, followed by a pause of one count. The Lead crosses left over right, steps side right, and steps back left, pausing on the fourth count. This can started with either foot in either direction, for four possibilities. Sentada No. 5 is a combination of Paso de Tango Acompasado No. 1 and Sentada No. 1, i.e., half of a box step in SQQ timing, plus a slow step in the direction of the first step (but with the other foot). 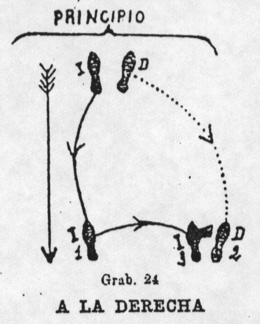 Altogether, the footwork is forward, side-close, forward (and hold), in SQQS timing, pausing on the fourth count. This can also be started with either foot in either direction, for four possibilities. 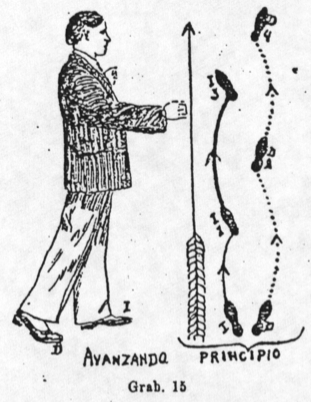 It can also be danced laterally, first crossing in front (as illustrated below) or behind, in mirrored fashion, Volcando El Medio or Volcando Afuera. Sentada No. 6 is similar to Sentada No. 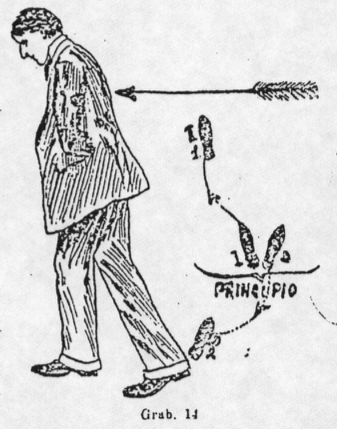 5 with the exception that the final slow step is in the opposite direction of the first step, as illustrated below. It's also in SQQS timing, pausing on the fourth count. In Sentada No. 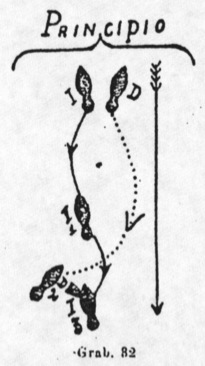 7, the dancers touch the foot in one direction without weight, then step on the same foot in the opposite direction, pausing for two counts. 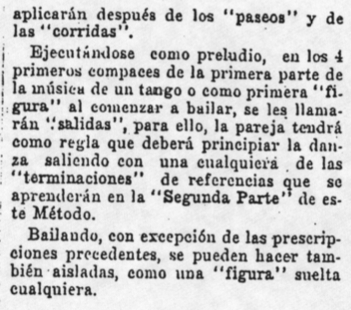 Lima notes that Saltitos can also be danced in the context of Sentadas. 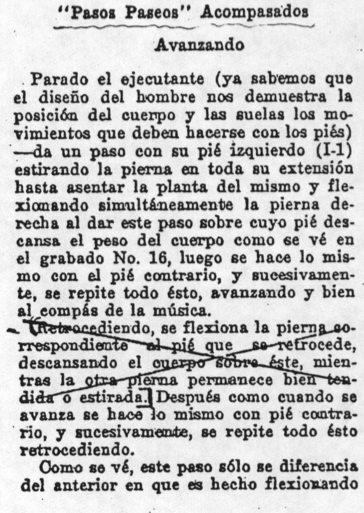 As an example, Lima describes La Sentada Unica (the solo sentada), a kind of Follow's Solo. The Lead dances two slow steps and pauses for two counts, as the the Follow dances one slow step and six quick steps. 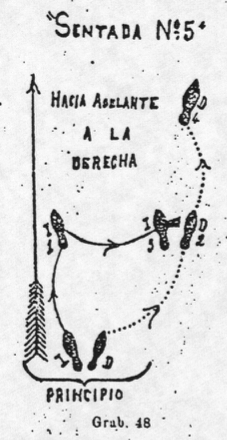 Lima notes that La Sentada Unica serves as a general illustration that in any Sentada, while one partner executes one figure, the other can execute a different figure during the same counts. As a minor adaptation of this figure, you can also both cross in front both times. 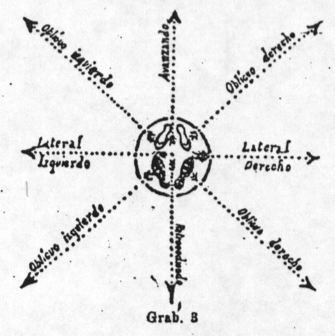 While not described by Lima, this version is also entirely consistent with his guidelines for constructing variations. 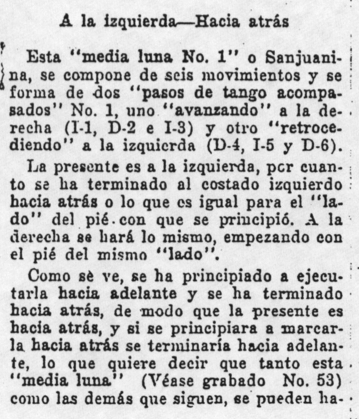 Media Lunas (half moons) are short figures (between 4 and 8 counts) that you repeat opposite, forward then backward, or to one side and then the other. Occasionally a Tango aficionado will describe tango as a "chess game of the feet," like figuring out a puzzle. It's fun to solve puzzles, and sometimes that takes trying out a few possible solutions, until you solve it. In Tango, you can puzzle out a somewhat tricky figure until your partner gets it, so it works even better with steps that can be repeated a few times, like these. As with most other steps in Lima's collection, each Media Luna can be done in multiple different dance positions and directions, adding even more to the puzzling quality. The Name: Named for the Argentinian province of San Juan (and its capital city). The Timing: Six steps in four counts, SQQ, SQQ. The Footwork: A simple box step. The Lead steps forward left (1), side right (2), and closes left to right (and), then steps back right (3), side left (4), and closes right to left (and). The Follow steps back right (1), side left (2), and closes right to left (and), then steps forward left (3), side right (4), and closes left to right (and). The Styling: This can either be danced as a square box, as illustrated, or Lima suggests that it can also be danced as an elongated box, with the slow steps a bit longer than a normal step, and the quick side steps about half the size of the slow steps. 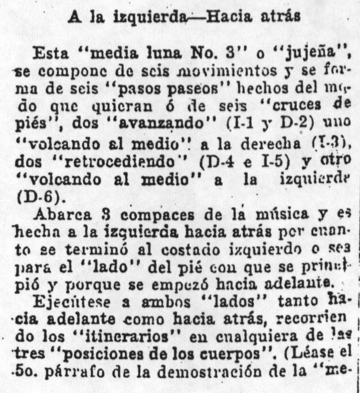 Variants: Lima also notes that alternative versions of this Media Luna can be constructed from Paso de Tango Acompasado No. 2, No. 3, and No. 4. The Name: Means "coming and going." The Timing: Two steps (and two sweeping touches) in four counts, S(S), S(S). 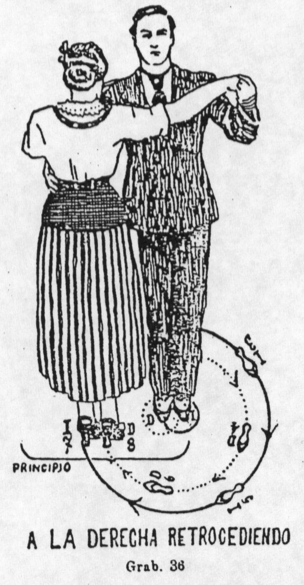 The Footwork: Similar to the later 1920s Charleston step, but with tango styling. The Lead steps forward left (1) and sweeps forward right (2), then steps back right (3) and sweeps back left (4). The Follow steps back right (1) and sweeps back left (2), then steps forward left (3) and sweeps forward right (4). The Styling: Steps can be straight forward and back (as illustrated), or can be danced as crosses, i.e., cross left over right, then sweep right across in front of left. Variants: Lima notes that you can also do this figure with two slow walking steps added to the beginning of each half: three steps forward and a touch forward, then three steps back and a touch back. The Name: Named for Argentina's remote northwestern province of Jujuy. The Timing: Six steps in six counts, SSS, SSS. 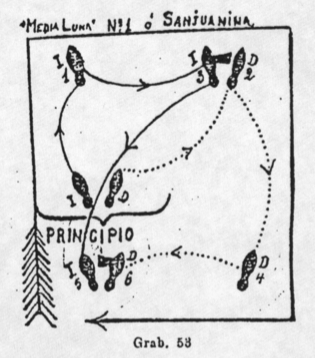 The Footwork: One of several Media Lunas involving cross-steps. 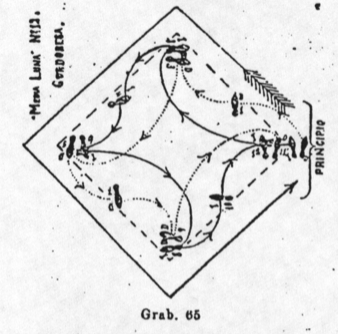 The Lead steps forward left (1), forward right (2), and crosses left over right (3), then steps back right (4), back left (5), and crosses right over left (6). The Follow steps back right (1), back left (2), and crosses right behind left (3), then steps forward left (4), forward right (5), and crosses left behind right (6). Variants: Lima also notes that both can cross over in front both times, or behind both times, or the Lead can cross behind as the Follow crosses in front. Or the cross-step can come first, followed by two steps forward (or backward). The Name: Named first for the shape it makes on the floor, a double four, and second for the Argentinian province of La Rioja (and its capital city). 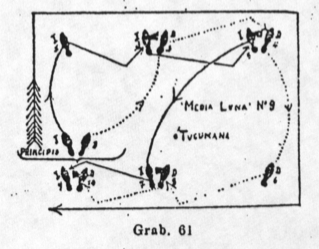 The Footwork: Another Media Luna involving cross-steps. The Lead crosses left over right (1), steps side right (2), back left (3), crosses right behind left (4), steps side left (5), and forward right (6). The Follow crosses right behind left (1), steps side left (2), forward right (3), crosses left in front of right (4), steps side right (5), and back left (6). Variants: Lima notes that you can also cross the same way (in front or behind) on both halves, or mirror your partner's crosses. You can also do it with an additional cross before each half. The Name: Named for the Argentinian province of La Salta (and its capital city). The Timing: Eight movements in four counts, QQQQ, QQQQ, but only six weight shifts, in SQQ, SQQ timing. The Footwork: This Media Luna forms the shape of a diamond on the floor. It feels like an ornamented, diagonalized box step. The Lead steps forward left on the left diagonal (1), closes right to left without weight (2), forward right on the right diagonal (3), close left to right with weight (4). Then he steps back right on the right diagonal (5), closes left to right without weight (6), back left on the left diagonal (7), close right to left with weight (8). The Follow steps back right on the right diagonal (1), closes left to right without weight (2), back left on the left diagonal (3), close right to left with weight (4). Then she steps forward left on the left diagonal (5), closes right to left without weight (6), forward right on the right diagonal (7), close left to right with weight (8). The Name: Named for the Argentinian province of Entre Ríos. 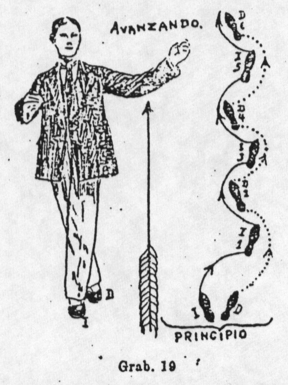 The Footwork: This Media Luna snakes forward and backward. The Lead crosses left over right (1), crosses right over left (2), locks left behind right (3), then crosses right behind left (4), crosses left behind right (5), then locks right in front of left (6). The Follow crosses right behind left (1), crosses left behind right (2), then locks right in front of left (3), then crosses left over right (4), crosses right over left (5), locks left behind right (6). The Name: Named for the Argentinian province of Santa Fe (and its capital city). The Footwork: This Media Luna feels like a hybrid of Media Lunas No. 3 and No. 4. The Lead steps forward left (1), forward right (2), and crosses left over right (3), then steps back right (4), back left (5), and crosses right behind left (6). The Follow steps back right (1), back left (2), and crosses right behind left (3), then steps forward left (4), forward right (5), and crosses left over right (6). Variants: Lima also notes that you can add two slow walking steps for a total of 8 counts, or subtract two walking steps for a total of four counts. As in Media Luna No. 3, you can also start it on the cross-step, and you can cross either way, parallel or mirrored. The Name: Named for the Argentinian province of Mendoza (and its capital city). The Timing: Ten steps in eight counts, SSSQQ, SSSQQ. The Footwork: This Media Luna is an elegant alternating parallel grapevine. The Lead crosses right over left (1), steps side left (2), crosses right behind left (3), and does a side close to the left (4-and). Then he crosses left behind right (5), steps side right (6), crosses left in front of right (7), and does a side close to the right (8-and). The Follow crosses left behind right (1), steps side right (2), crosses left over right (3), and does a side close to the right (4-and). Then she crosses right over left (5), steps side left (6), crosses right behind left (7), and does a side close to the left (8-and). 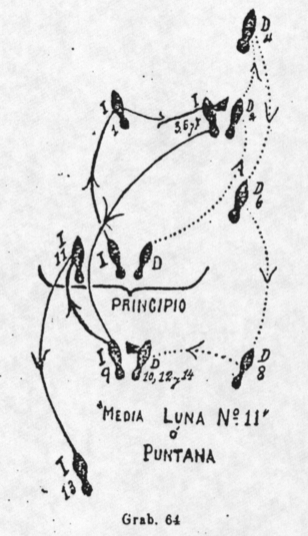 Variants: Lima notes that this Media Luna (like all the others) can be danced starting on the other foot. The Name: Named for the Argentinian province of Tucumán. The Timing: Ten steps in six counts, SQQQQ, SQQQQ. The Footwork: This is an extended version of Media Luna No. 1, with an extra side close on the end of each half. The Lead steps forward left (1), side right (2), close left to right (and), side right (3), close left to right (and). Then he steps back right (4), side left (5), close right to left (and), side left (6), close right to left (and). The Lead steps back right (1), side left (2), close right to left (and), side left (3), close right to left (and). Then she steps forward left (4), side right (5), close left to right (and), side right (6), close left to right (and). Variants: Lima notes that you can also add an extra side-close, for fourteen steps in eight counts, SQQQQQQ, SQQQQQQ. The Name: Refers to a port city in Argentina, most commonly, Buenos Aires. 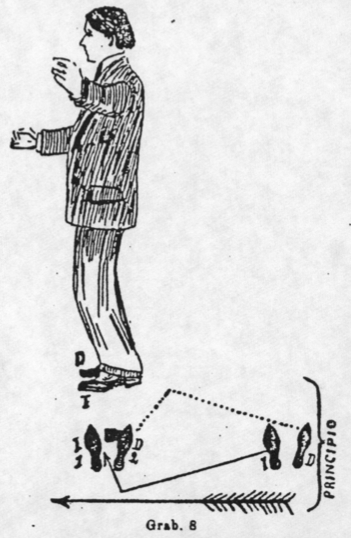 The Footwork: This is a hexagon shaped box step. Stepping on the sides of a hexagon, the Lead crosses left over right (1), right over left (2), and steps side left (3), then crosses right behind left (4), left behind right (5), and steps side right (6). The Follow crosses right behind left (1), left behind right (2), and steps side right (3), then crosses left over right (4), right over left (5), and steps side left (6). While the steps are the same, the feeling is quite different: this version feels like an alternating promenade in Yale (Paralelas) position. It works best if you keep the Follow backing in the same orientation for 2-3-4, and 5-6-1. The Name: Refers to the central province of San Luis (and its capital city). The Timing: Fourteen steps in eight counts, SQQQQQQ, SQQQQQQ. 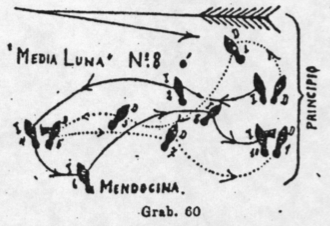 The Footwork: This is a version of Media Luna No. 1 with added rocking steps. First half of a box in slow, quick, quick timing, then four quick rocking steps: Lead forward, replace, back, replace. Second half of a box in slow, quick, quick timing, then four quick rocking steps: Lead forward, replace, back, replace. Variants: Lima notes that you can replace the slow forward and back steps with cross-steps. Richard Powers proposes this minor adaptation: the first time, the Lead rocks back, replace, forward, replace. This feels more symmetrical, and is a bit easier to lead and follow. While not described by Lima, it is entirely consistent with his guidelines for constructing variations. The Name: Refers to Cerro Gordo, a mountain peak in the province of La Salta. The Timing: Twelve steps in eight counts, SQQSQQ, SQQSQQ. The Footwork: This Media Luna is a crossing, right-turning, diamond-shaped box. Facing north, the Lead crosses right over left to the northwest (1), turning 90° clockwise to take a side-close to the north, facing east (2-and). 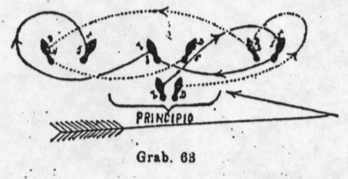 He then crosses left behind right to the southwest (3), turning 90° clockwise to take a side-close to the west, facing south (4-and). Repeat to return to home position. Facing south, the Follow crosses left behind right to the northwest (1), turning 90° clockwise to take a side-close to the north, facing west (2-and). She then crosses right over left to the southwest (3), turning 90° clockwise to take a side-close to the west, facing north (4-and). Repeat to return to home position. 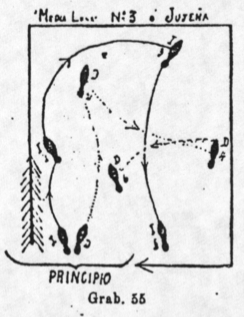 Variants: Lima also notes that you can start it on the left foot, in this case, turning counterclockwise. The Name: Named for the Argentinian province of Corrientes (and its capital city). The Timing: Eight steps in eight counts, SSSS, SSSS. 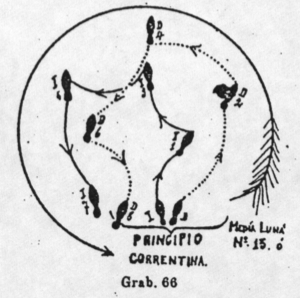 The Footwork: This is basically just walking in a counterclockwise circle (often done as an exercise in Tango classes). The Lead crosses left over right (1), then steps forward right (2), side left (3), and crosses right over left (4). 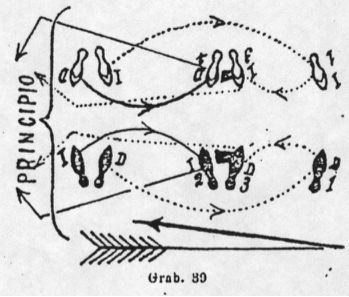 Then he steps side left (5), back right (6), crosses left behind right (7), and steps side right (8). The Follow crosses right behind left (1), then steps back left (2), side side (3), and crosses left behind right (4). Then she steps side right (5), forward left (6), crosses right in front of left (7), and steps side left (8). Variants: Lima notes that you can subtract two or four slow steps, for a total of six steps or four steps, respectively. The Name: Named for the Argentinian province of Catamarca. The Timing: Six steps (and two touches) in eight counts, S(S)SS, S(S)SS. 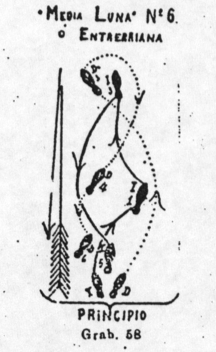 The Footwork: This is a diamond-shaped figure ornamented with touches to the right and left sides. The Lead crosses left over right (1), touches right forward on the right diagonal (2), crosses right over left (3), and steps left forward on the left diagonal (4). Then he crosses right behind left (5), touches left backward on the left diagonal (6), crosses left behind right (7), and steps right backward on the right diagonal (8). The Follow crosses right behind left (1), touches left backward on the left diagonal (2), crosses left behind right (3), and steps right backward on the right diagonal (4). Then she crosses left over right (5), touches right forward on the right diagonal (6), crosses right over left (7), and steps left forward on the left diagonal (8). 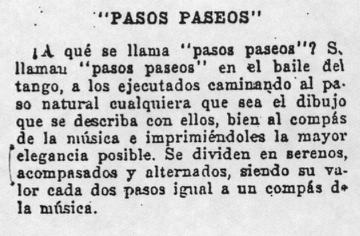 Paseos (walks) are 12 bar sequences of steps, either a repetition of one figure, or a combination of several. Paseos Lentos include only slow steps. 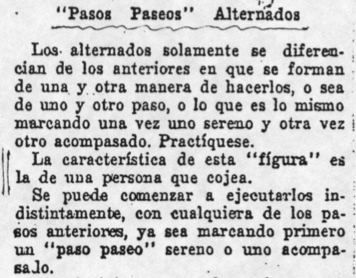 Paseos Alternados include both slow and quick steps. Lima promises to describe 30 Paseos in Part II of his book, which has yet to be found. Terminaciones (endings) are 4 bar sequences of steps used to end a phrase of music. 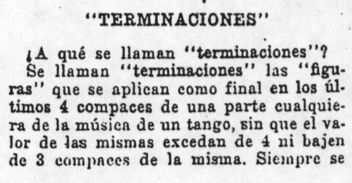 Salidas (departures) are ways to begin a Tango phrase. 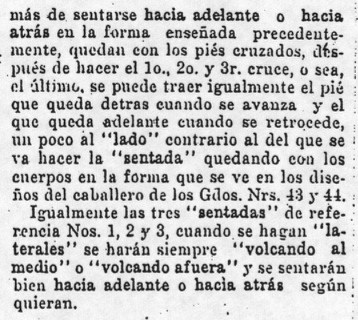 Lima promises to describe 20 Terminaciones (and an unknown number of Salidas) in Part II of his book, which has yet to be found. 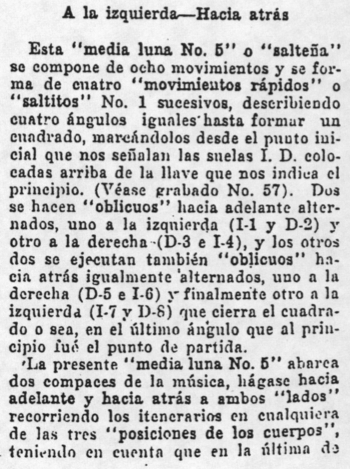 Con esta 'Primera Parte' del Método, pueden bailar ejecutando las 'figuras' que les agrade o combinando unas con otras . 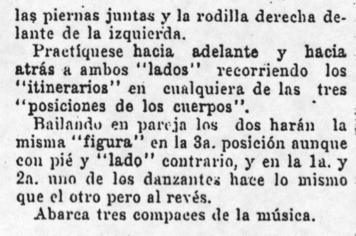 . . Bálese cominando unas 'figuras' con otras, o marcando estas sucesivas, con mucho compás y elegancia, acostumbrándose a contar los compaces de cada parte de la música de un tango cualquiera que se ejecute y procurando encuadrar el valor de las 'figuras' citadas á dichos compaces. With this First Part of the Method you can dance, executing the figures you like best, or combining some with others . . . Dance along combining some figures with others, or leading these successively, with much rhythm and elegance, getting accustomed to counting the beats of each part of the tango music along with whichever step you may be executing, and allowing yourself to grasp the value of each figure and its timing. 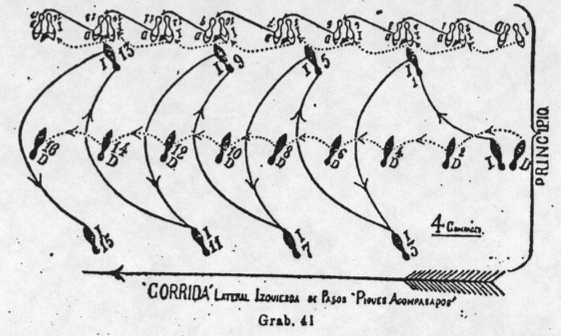 Corridas (runs) are series of four or more quick steps in sequence. 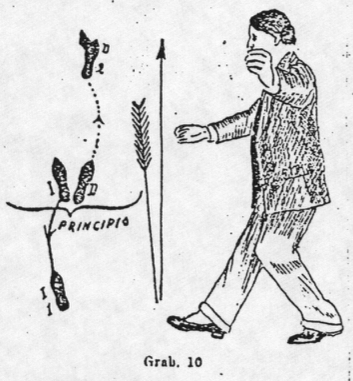 The Paso Pique Acompasado in this book is one example of a Corrida. 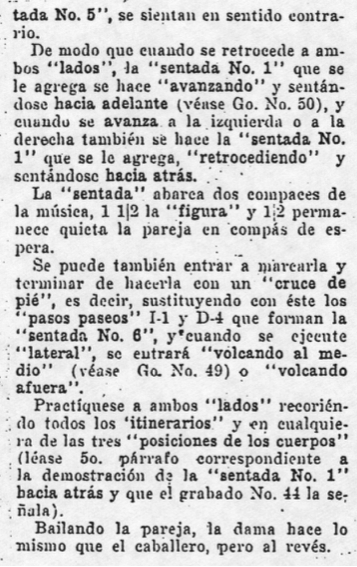 Lima promises to describe 10 Corridas in Part II of his book, which has yet to be found. 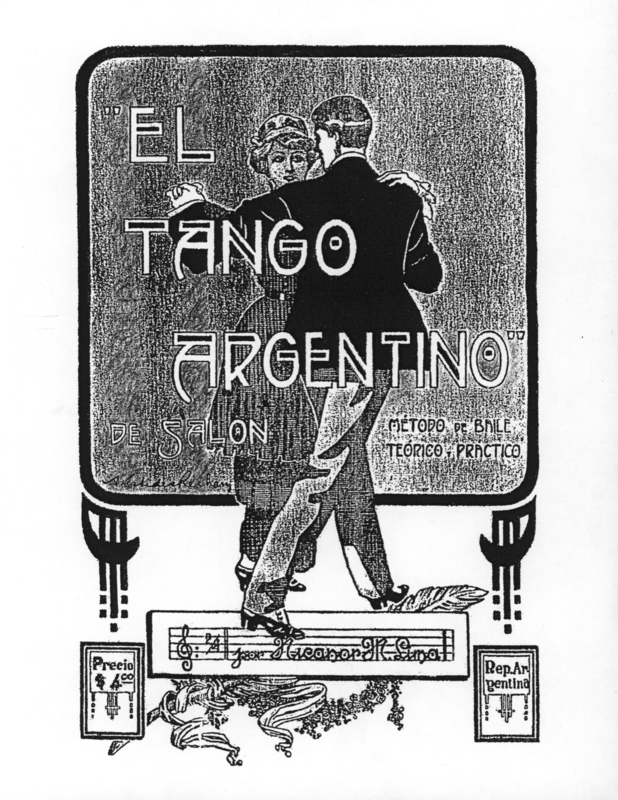 If you or your community is interested in learning Lima's Early Buenos Aires Tango, .